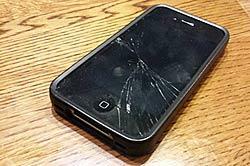 Several months ago, my wife’s iPhone slipped from her hands and hit the floor, screen-side down. You might say this affected the phone’s resale value. My wife was a trooper though. She used that phone for two more months, delicately placing it against her ear every time she answered a call and deliberately moving her finger across the screen as she texted, surfed, and played games. But with the phone suffering from other problems, we knew we had to replace it sooner rather than later. Here’s the thing: no way on God’s green Earth were we going to pay $500 or more for a brand new phone. Thankfully, neither my wife nor I feel the need to have the latest and greatest phone on the market. She had been using an iPhone 4 which she bought used from a local seller for $200 a few years ago; and I recently purchased a used HTC One M7 on eBay for $165. While we had little to no issues with buying locally or shopping eBay for her next phone, we were looking for a way to purchase a used phone with more confidence. That search led us to Swappa. Swappa launched in 2010 and promotes itself as a safe place to buy and sell mobile devices online. To protect buyers, Swappa does not allow phones with cracked screens or water damage to be sold on their site. Listings are reviewed by staff members: this includes an ESN check and requires verification photos that prove sellers actually own the mobile device they are selling. Purchases are made via Paypal to protect both the buyer and the seller. And, as with eBay and many other online markets, sellers are rated (Swappa uses a five-star system) and buyers can leave reviews of their transaction experience. You can browse mobile devices on Swappa by carrier or by brand, and can also do a search for a specific phone. We have a plan with T-Mobile, and after researching phones for a few days my wife decided she wanted a Samsung Galaxy S4. Once you’ve selected a phone, you will be brought to a screen that shows all the available listings for that phone. You can drill down your search and filter by condition, color, and storage space to help you find exactly what you’re looking for. Since this is an open market, the prices for a phone can vary greatly but from my experience, it appears that phones of similar condition are competitively priced. The checkout process is simple and should be familiar with anyone who uses Paypal regularly. After completing the checkout, you will have a page for your purchase where information on the transaction is kept and updated. This includes a message area where the buyer and seller can communicate. You can even choose to include a Swappa staff member in your conversation should you feel their input is needed. This turned out to be a very helpful feature for us. 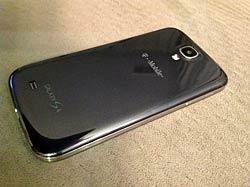 We purchased a Samsung Galaxy S4 on a Friday and received it the following Monday – exceptional shipping time. Unfortunately, there was an issue with the phone’s wifi. I mentioned this to the seller and invited a Swappa staff member into the conversation as the site suggests in these situations. The seller was apologetic and the Swappa staff member moderated the return and refund process. My wife and I later made a second transaction with a different seller on Swappa and purchased a mint 16GB Galaxy S4 with a Samsung-branded charger for $230. We could have bought the phone for less than that: eBay and other resale sites had listings under $230. However, we really liked the shopping experience on Swappa and appreciated the protection the site offers buyers. And when it comes to buying used online – particularly with electronics – buying with confidence is just as important to my wife and me as finding the right price. I already contacted the seller for that transaction 3 weeks ago, because I am not satisfied with this order. I don’t think the phone was actually new as stated on the add, because the plastic protections have been removed and put back in place several times. Plus the needle to insert the SIM card was missing from the package. I couldn’t put my SIM in place and actually use the phone. I have no answer from the seller, and I can not leave a comment on that seller to warn others. Thanks for the note Liz – and glad to have you following along! Nice review. Still having great luck with TING.com, btw. You might want to consider a follow up review on TING, because I think they’re growing and helping put downward pressure on the BIG-4 cell companies to lower prices. Hey Andy. Glad you like Ting. We’ll definitely consider doing another review on them. I think Ting and Republic Wireless are causing a lot of downward pressure. I’ve thought about Ting in the past but it ended up not being cheaper than my current family plan. It was close though; if I weren’t on a family plan Ting definitely would have been much cheaper.